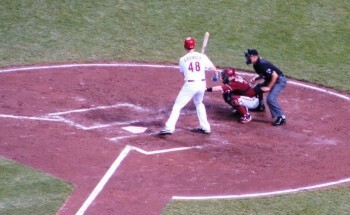 Ryan Ludwick laying off a ball outside. The Reds were winners again yesterday, taking down the Padres 3-7. Mike Leake did the starting for the team and had a good outing: 1 run on 5 hits in 6.0 innings. Ryan Ludwick came through big time with a 3-run homer in the seventh inning to break the 1-1 tie and give the Reds a lead they wouldn’t lose. Joey Votto also his a home run to provide some padding and something us to talk about. Today the Reds host the Royals at 4:05 p.m. Mat Latos will be taking his turn at last-chance-to-rock-spring training. The Red Hot Family is taking a vacation! We’re heading to that traditional spring break destination of London, England. Damn the luck that spring break is falling on the week of Opening Day and Opening Night, which has been our favorite tradition for the last 2 years. I don’t even know if they get ESPN across the pond, let alone Fox Sports Ohio, so we’ve bribed a couple guest bloggers with the promise of scones to take over while we’re gone. They’re both far more knowledgeable and emphatic about sports than I am, so I expect to see some real high quality content here for the next week for a change. But don’t worry! We’ll be back to writing the same goofy crap you’ve grown accustomed to before you know it. The Reds have 2 more pitchers to cut before opening day. Which is just 4 days away. Yes, the Cincinnati Reds are fine-tuning their intensity. For most of spring training, the Reds’ players were obviously testing out things other than winning. Which was fine. For the first time since I can remember, there were no true battles for roster spots. Everything was set, and everyone had time to work on things and ease back into baseball. Now that opening day is less than a week away, it’s time to practice how to win. And the Reds have done that two games in a row. Yesterday, Mike Leake made his final start of the spring and did well. Leake pitched 6 innings, allowing 1 run on 5 hits and no walks while striking out 4. The offense has woken up, too, and I’m certain that all the regulars playing most of the game is a factor. Shin-Soo Choogot the Reds on the board in the 5th with a solo shot. But Ryan Ludwick was the hero for this game, hitting his first spring home run in the 7th inning, a 3-run shot that broke a 1-1 tie. Then in the 8th, Joey Votto added his own 2-run home run to extend the lead, which was good, since the San Diego Padres scored a couple more in the top of the 9th.